“It’s hard to imagine that stricter gun control laws would have any discernible value in averting tragedy. Homicides have actually declined since the demise of the assault weapons ban. “The Violence Policy Center’s … own data, when inspected closely, doesn’t dent the case for gun rights. Over the past four years, there have been more than 60,000 homicides in the United States. The slayings carried out by permit holders amount to fewer than one of every 200 murders. For every licensee who killed someone, there are more than 20,000 who didn’t. Nor does the evidence indicate that allowing people to carry pistols causes crime. Many of the shootings done by permit holders took place in their homes—where you don’t need a concealed-carry license to keep a gun…. …When Florida captured national attention by legalizing it in 1987, critics forecast mass carnage. When other states followed suit, the same predictions were heard. But they turned out to be false alarms. Instead of an epidemic of violence, the nation saw a drop. Since 1991, the murder rate has been cut nearly in half. You don’t have to believe that “shall-issue” laws caused the decline to grasp that they certainly didn’t get in the way. Rolling Stone reported recently on a “kill team” in Afghanistan. The online edition of the Rolling Stone story contains a section with a video called “Motorcycle Kill,” which includes our Soldiers gunning down Taliban who were speeding on a motorcycle toward our guys. These Soldiers were also with 5/2 SBCT, far away from the “Kill Team” later accused of the murders. Rolling Stone commits a literary “crime” by deceptively entwining this normal combat video with the Kill Team story. The Taliban on the motorcycle were killed during an intense operation in the Arghandab near Kandahar City. AQAP and the Vacuum of Authority in Yemen is republished with permission of STRATFOR. While the world’s attention is focused on the combat transpiring in Libya and the events in Egypt and Bahrain, Yemen has also descended into crisis. The country is deeply split over its support for Yemeni President Ali Abdullah Saleh, and this profound divide has also extended to the most powerful institutions in the country — the military and the tribes — with some factions calling for Saleh to relinquish power and others supporting him. The tense standoff in the Yemeni capital of Sanaa has served to divert attention (and security forces) from other parts of the country. As the battle for the future of Libya continues, the excitement is almost palpable among Libyan-born al Qaeda fighters and other Arabs hunkered down in Pakistan’s remote and lawless tribal area. According to Afghan Taliban sources close to Osama bin Laden’s terrorist group, some of the 200 or so Libyans operating near the Afghan border may be on their way home to steer the anti-Gaddafi revolution in a more Islamist direction. “…Project Gunrunner was the spawn of Beltway bipartisanship. It was established in 2005 as a pilot project under the Bush administration and run by the Bureau of Alcohol, Tobacco, Firearms and Explosives. The intended goal of the program’s sting operations: stop illicit firearms trafficking along the Southwest border through close surveillance of undercover gun purchases and coordinated intervention with Mexico. The deadly result: federally sanctioned gunwalking of high-powered weapons from U.S. officials right into the hands of drug cartel killers…CBS News reported last month that Project Gunrunner “allegedly facilitated the delivery of thousands of guns into criminal hands. (Reuters) – “President Barack Obama has signed a secret order authorizing covert U.S. government support for rebel forces seeking to oust Libyan leader Muammar Gaddafi, government officials told Reuters on Wednesday. Photo Credit: Sgt. Breanne Pye, Public Affairs Office, 1st Brigade Combat Team, 4th Inf. Div..
KANDAHAR, Afghanistan — Flip through history’s pages and you will find countless stories of men and women throughout the ages, who have taken incredible journeys and overcome impossible odds, to become our most celebrated heroes. 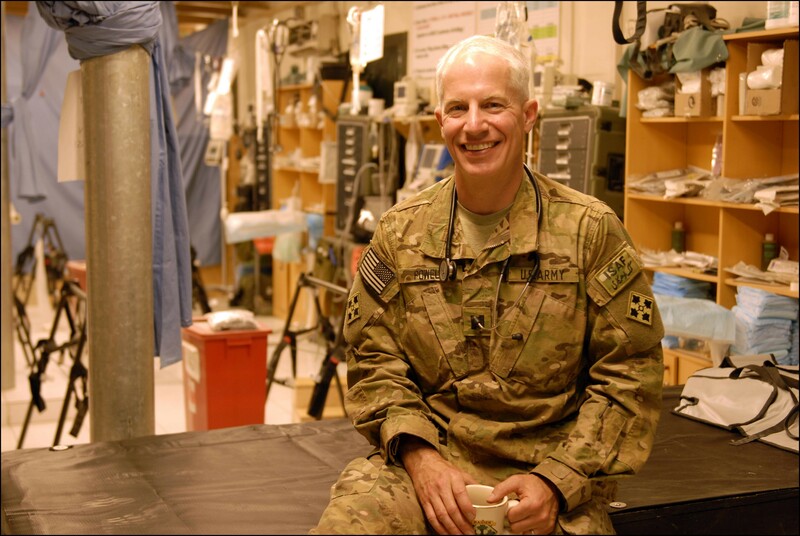 Though the heroes from our history books are an impressive lot, if you’re looking for a modern day hero, you won’t have to look any farther than 1st Brigade Combat Team, 4th Infantry Division’s 49-year-old combat surgeon, affectionately referred to simply as ‘Doc’ throughout Task Force Raider. Sgt. Meredith Burns has fielded numerous questions about females in combat since she deployed to Afghanistan as 2nd Battalion, 3rd Marine Regiment’s Female Engagement team leader nearly six months ago. The FET is a favorite target of media looking to document females on the front lines, but the real story is sometimes lost, Burns said. The FET Marines aren’t meant to be interchangeable with infantry regulars; rather, they complement the coalition counterinsurgency strategy by reaching out to Afghan communities in a culturally sensitive way. They help amplify the voice of Afghan women. When asked what civilian job is like being a FET Marine, Burns smiled thoughtfully, pondering the question. Like a community organizer? A negotiator, a fund-raiser? ANAHEIM — “An arrest warrant has been issued for a California businessman who has been charged with counterfeiting high-tech rifle sights in a scheme to sell them over the Internet. “…Hideaki maintained his composure and navigated his way through the submerged city, finally tracking down his old house. He quickly swam through to find his totally-freaked-out wife, alone and stranded on the upper level of their house, barely keeping her head above water. He grabbed her tight, and presumably sharing his rebreather with her, dragged her out of the wreckage to safety. She survived. … once again Hideaki navigated his way through the Atlantean city, picking his way through crumbling wreckage, splintered wood, and shredded metal to find his elderly mother. After another grueling trek, he tracked her down on the upper levels of a house – she’d been stranded there for four days, and would almost certainly have died without the timely aid of her son. He brought her to safety somehow as well, as you might expect at this point. “Hamilton, Mont., Radio Shack Super Store owner Steve Strand … [is] making sure that new Dish Network account subscribers get the Second Amendment protections they deserve with an open-an-account, get-a-gun deal. According to Strand, it has tripled his business since the promotion started last October. And, he said, easily hundreds of people have stopped in to see what the sign is all about. “Protect yourself with Dish Network. Sign up now, get free gun,” the sign reads. What Happened to the American Declaration of War? is republished with permission of STRATFOR. Amateur Radio spectrum is a crutial part the country’s ability to respond to emergencies and disasters. During 9/11, the Space Shuttle Columbia Disaster, and virtually every storm and hurricane, that spectrum is used by unpaid volunteers to provide absolutely essential communication, often when government resources are not available. The Federal government is trying to sell an important and limited resource in a short-sighted attempt to pay for more toys for DHS. If DHS needs more equipment then they should make their case before congress and get the appropriations like the DOD and everyone else. Just because you dont personally use that radio spectrum doesn’t mean its not important to the nation. Why dont we just sell Yellowstone Park to the Chinese while we are at it, that would raise some cash too. Ham radio enthusiasts nationwide are concerned about a bill in Congress that they say would limit their ability to help in disasters and emergencies. Rep. Pete King, R-N.Y., chairman of the Homeland Security Committee, introduced legislation last month aimed at enhancing emergency communications for first responders by reallocating certain frequencies exclusively for public safety. To offset lost revenue from that change, the bill includes a provision that would allow the 420-440 MHz frequencies currently provided free to amateur radio to be auctioned off. Those frequencies are used not just by hobbyists but also by hundreds of thousands of Amateur Radio Emergency Service volunteers and severe-weather spotters working with National Weather Service. …”It’s a bad idea. It’s not good for public safety,” said Harlin McEwen, chairman of a technology committee for the International Association of Chiefs of Police and a spokesman for the National Public Safety Telecommunications Council.